I know it's not exactly "half moon", coz I didn't have those rounded tapes. 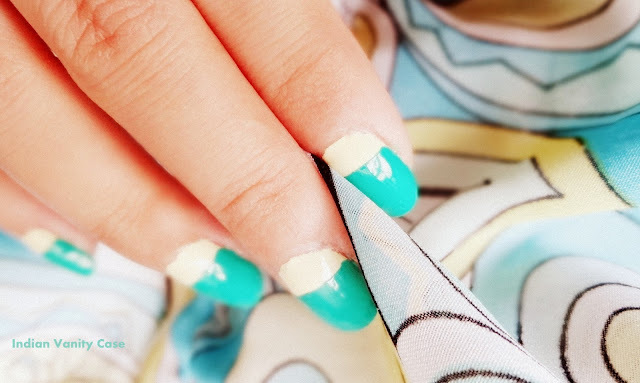 I'm no nail art expert, so I use the easiest methods to play with my nail polishes. This method is not the most original, as you may have seen it before, but I did it for the first time last night & decided to put up a tut. I could have used another better/cuter color combo but, I don't know, somehow I settled for these. Scotch Magic Tape - I cut it in half vertically. What do you think? Have you tried this method before? Pretty one.. Well for this effect U can try nail tip guides from konad available on urbantouch…..
Oh ok...will check them out then...thanks! What nail polish do you use?